Olivia May, on the site of an archaeological dig in England. Notre Dame junior Olivia May has been interested in classical cultures for a long time. During the summer of 2015, she was able to experience one in a new way—by physically sifting through its remains. Following two semesters of intensive and inspiring classroom experiences through the Glynn Family Honors Program, the Wisconsin native received an award from the U.S.-U.K. Fulbright Commission to study in Northern Britain. The four-week program, housed at Durham University, explored the classics through archaeology. For the first two weeks, May and her five fellow Fulbright recipients spent eight to nine hours a day digging at the site of an ancient Roman fort, helping to uncover evidence of the Roman Empire’s influence in England. “It was the end of a seven-year project, so most of what they were looking for were samples that they could later analyze for further information,” she said. The students found various artifacts—spoons, rings, pieces of pottery—that allowed them to better understand the people who had once resided at the Binchester Roman Fort and how they lived. In the second half of the program, May took a course on the region itself, studying the history of Northumbria, a medieval kingdom in what is now northern England and southern Scotland. After class each day, she took the opportunity to explore the area. The experience, her first time in Europe, inspired her to consider returning to study abroad. May first developed a passion for Roman culture and mythology through her high school Latin classes, eventually choosing to major in classics and English at Notre Dame. The Glynn program’s first-year curriculum, which features small, seminar-style classes, was a perfect fit because it allowed her to explore her majors while discovering new subjects in classes she might not have taken otherwise. In particular, May enjoyed a glimpse at a “different way of thinking” in an introductory philosophy course and learned to engage with literature in a new way in her honors seminar with Joseph Buttigieg, the William R. Kenan Jr. Professor of English. 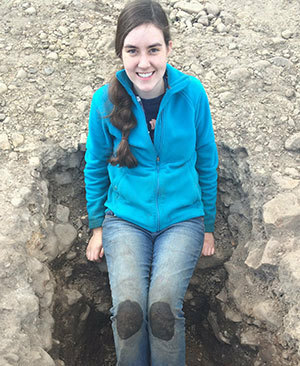 While further experience with archaeology isn’t in May’s long-term plan, her fieldwork and coursework at the Fulbright-Durham University Summer Institute prepared her well for the year ahead. Originally published by Tessa Bangs at al.nd.edu on October 19, 2015.